For a complete description of the application and the list of all main features and options, read general information and answers to frequently asked questions. 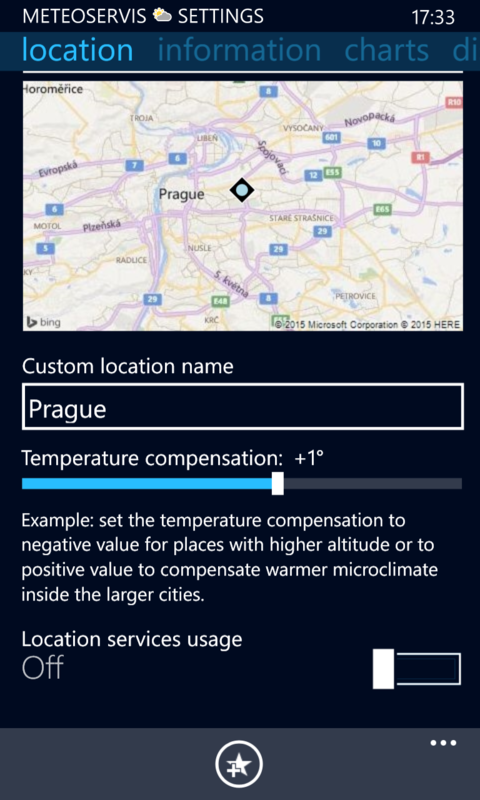 Application Meteoservis (all editions) is distributed only through the official Windows Phone Store (Markeplace). Download links can be found below on this page. 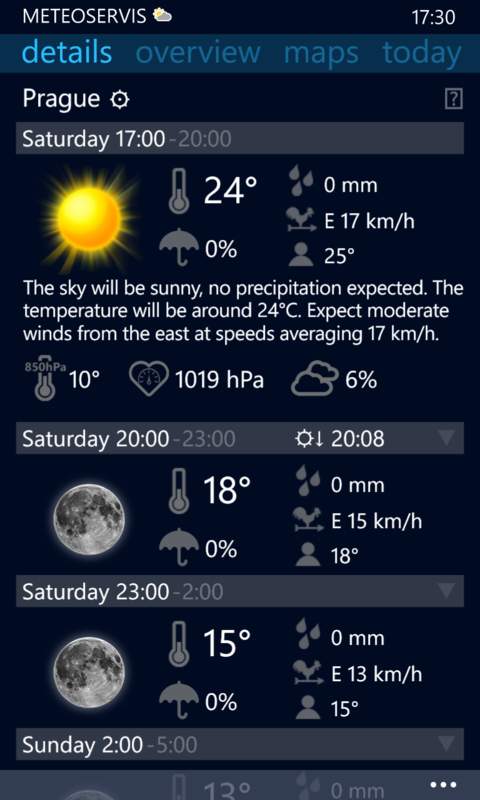 LockScreen and LiveTile on the main screen displays the weather forecast for selected period and for current location. Optionally, your favorite image/map can be displayed so you always have an immediate overview e.g. of the forthcoming precipitation (unavailable in Lite edition). Meteoservis is available in several editions, which differ in their capabilities and amount of data displayed. Of course, you can download Trial versions before purchase. 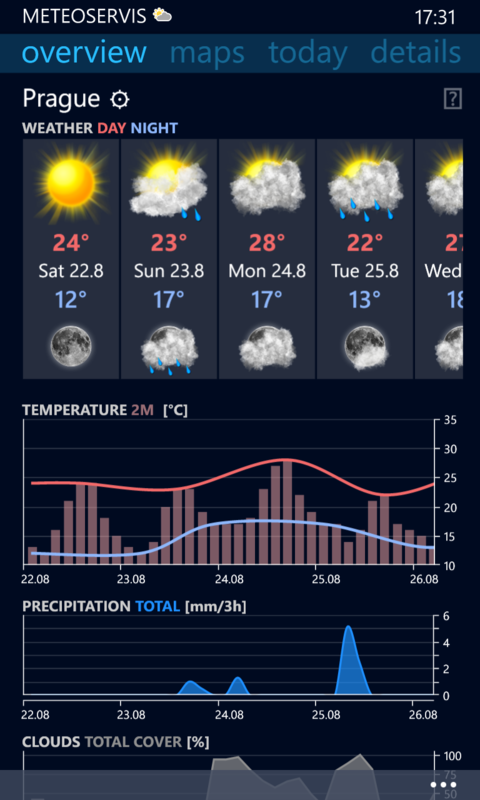 Users who are satisfied with basic weather and forecast information may use Meteoservis Lite edition which has some limitations but it’s free. For advanced users, amateur meteorologists or weather fans we have Meteoservis Pro edition which contains comprehensive information about the current weather and more detailed forecast information, including forecast analysis tools (coming soon). Meteoservis is available in several editions, which differ in their capabilities and amount of data displayed. Here you can find detailed description of each edition including a comparison of their features. Before purchasing, you can download trial version. 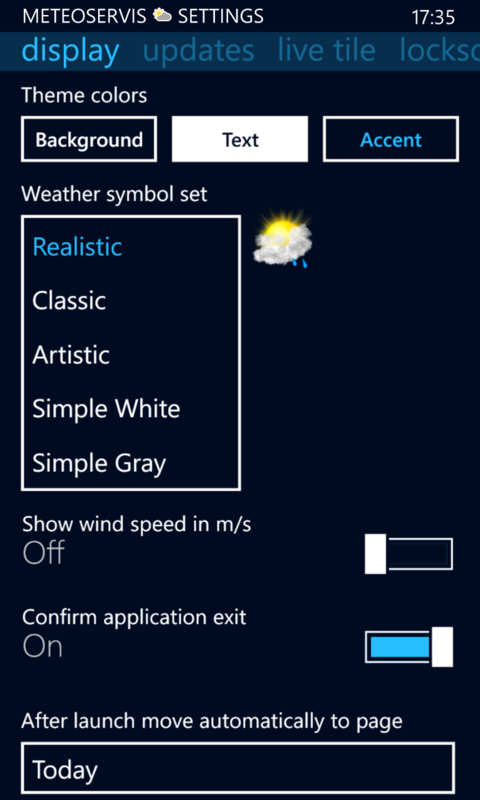 The current version of the application for Windows Phone you can install through the following links. What’s new you can see here. This standard edition is designed for ordinary users and contains complete forecast updated at least 2 times a day and all most important information about the current weather situation. But does not include any other special information, such as synoptic situation, map of lightnings, pressure and T850 temperature graphs nor tools for forecast analysis. 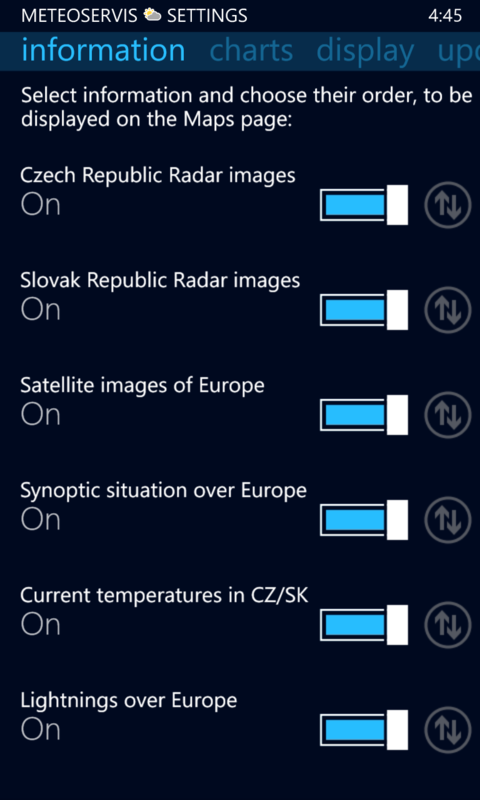 A possibility to display radar images on the back side of the LiveTile is available. This extended edition is intended for advanced users who will find here comprehensive information about the current weather and more detailed forecast information, including forecast analysis tools(coming soon). You can find here a map of lightning activity in Europe, synoptic situation map and other data and charts from the weather forecast model. This edition is especially appreciated by amateur meteorologists, enthusiasts and weather fans. 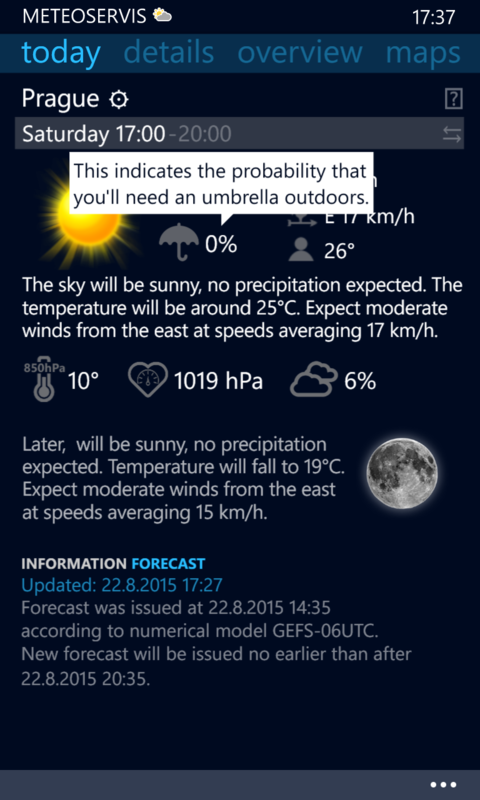 This freeware edition is designed for users who are satisfied with basic weather and forecast information. It has some limitations but it’s free. 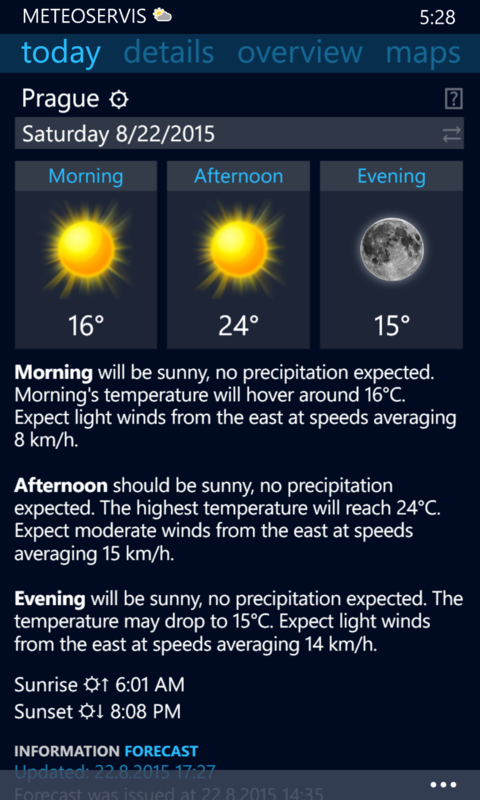 Forecast is updated only once a day. Only 3-days forecast is supported. There are only basic information about the current weather conditions and the number of history images is limited to 12. You cannot use the back side of the LiveTile for radar images, etc. We do not provide technical support. Bad weather? See what’s on TV or in your cinema!